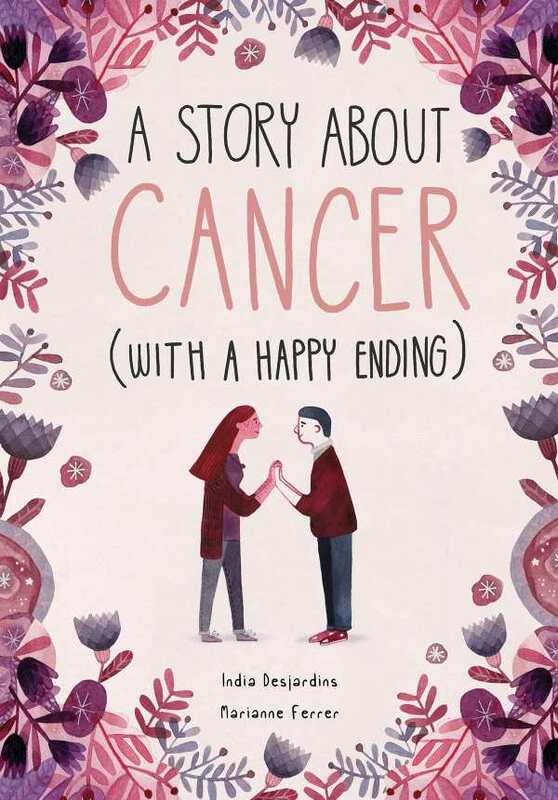 Cancer is a difficult subject for children to process, as India Desjardins’s A Story about Cancer with a Happy Ending shows. The book follows one child’s experience of the disease with inspired, no-holds-barred determination. It is illuminating and emotionally realistic. A teenager walks down the pale corridors of a hospital, headed to the doctor’s office with her parents, expecting to receive her latest diagnosis. She considers everything that has transpired within these walls: It was five years ago that she learned she had leukemia; she underwent treatments that also made her sick; she lived with the pressure and disappointment of of having to “stay strong” for her family. The character also lost her best friend to cancer and found her first love while in remission. She remains guarded but hopeful for a disease-free future. Although the story ends happily, the teenager’s journey is filled with uncertainty and fear. The contrast of colors in the artwork highlights this emotional roller coaster. The narrator floats across the pages in a dreamy haze, her elongated limbs splotched in green and grey patches to emphasize the progression of disease. This alternates with splashes of lavender that show her yearning for out-of-hospital experiences. She sees the fear of her diagnoses reflected in the blurred and scribbled faces of strangers and acquaintances who turn away from her. The story builds in emotional intensity and culminates in a showdown between the teenager and her mother. In a moment of desperation, appealing for understanding, the teen asks, “Mom, if I don’t get better, will you be disappointed in me?” It is a courageous acknowledgement of the realities of the situation, providing perspective for family members in denial or who are hungry for signs of hope. Desjardins captures the experience of childhood cancer with quiet, empathetic prose. Despite the heaviness of its subject matter, this brief and gripping story will inspire hope through its raw and honest vulnerability.